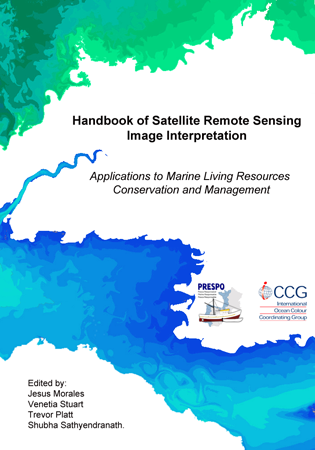 Handbook of Satellite Remote Sensing Image Interpretation: Applications for Marine Living Resources Conservation and Management (2011), EU PRESPO and IOCCG, Dartmouth, Canada, p. 293. The IOCCG, in conjunction with the EU PRESPO Project for sustainable development of the artisanal fisheries in the Atlantic area (within the INTERREG IVB Programme) has prepared a handbook of satellite remote sensing image interpretation, with a focus on applications for marine living resources conservation and management. This handbook is intended as a web-based educational/training document oriented towards the interpretation of satellite images derived from data freely available (for the most part) from various space agency archives. The current knowledge in this field is represented through a number of case studies which guide the end-users on how to download and interpret the satellite-derived image data. The case studies cover a range of applications including fisheries and aquaculture, phytoplankton and macroalgae, marine ecosystem characterization and air/water quality. You can download a complete copy of the handbook (125 MB), or you can download the individual case studies. Most of the images are saved at high resolution, so you can “zoom in” to see the details. The handbook is also available for download from the EU PRESPO website.